As I mentioned in my previous post about Hudson’s Seafood, South Carolina is famous for its Carolina White Shrimp, a species that is indigenous to the region and is consumed almost entirely in the local area. The species thrives along the entire eastern seaboard, and you might get a small percentage of them caught in local catches further north and south, but the highest concentrations of them are in the Carolinas. It has a characteristically sweet flavor and its texture isn’t as firm as shrimp from colder waters. 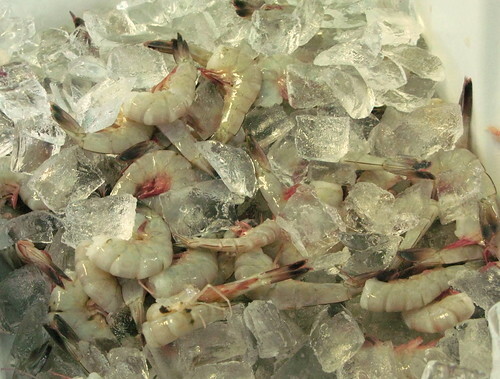 While many local restaurants in Hilton Head, Savannah and Charleston serve the Carolina shrimp, it is also possible to buy it from local seafood retailers and bring it back to your timeshare unit to cook yourself. 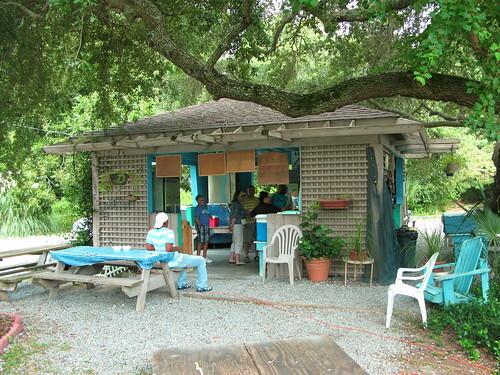 One of the ones we were recommended to on Hilton Head Island itself was Barnacle Bill’s. 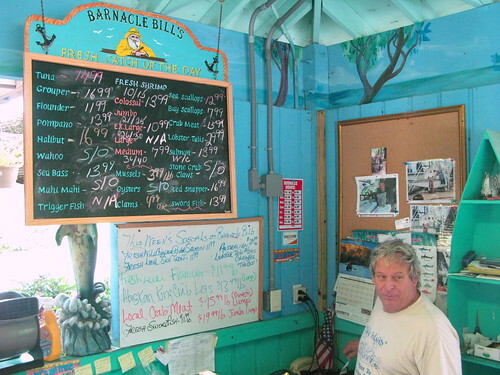 Barnacle Bill’s is literally a shack on William Hilton Highway, a strip of road where many of the major time share complexes are located, right off the beach. 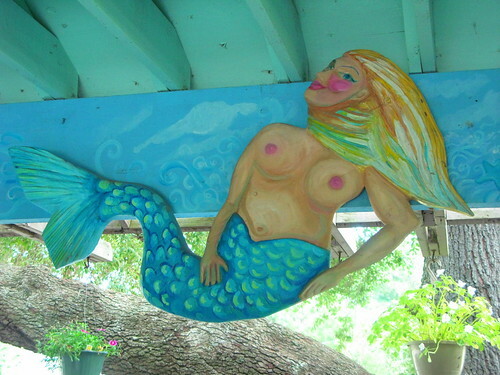 Like any salty sea dog, Barnacle Bill has an appreciation for mermaids. 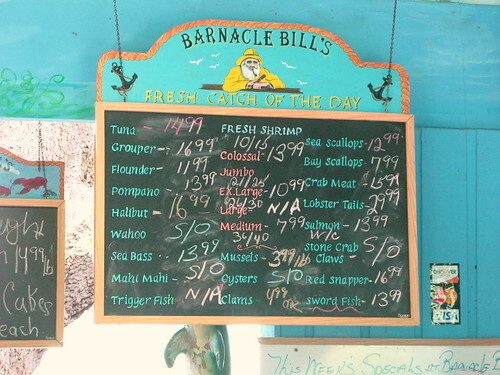 Bill’s price list. Availability changes constantly, and you want to try to get to the shack early in the day. 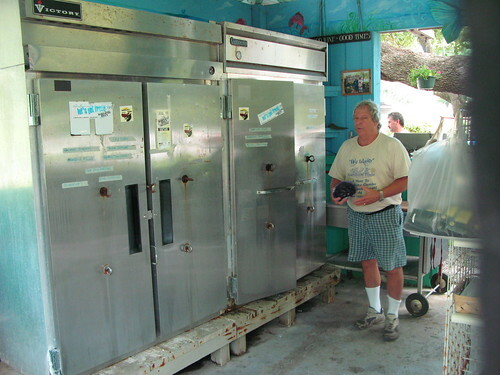 A wall of several large commercial refrigerators which Bill uses to keep his product fresh. 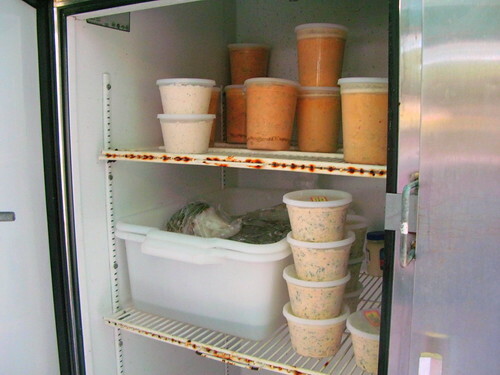 In addition to raw seafood Bill also stocks soups and chowders, ready to eat. 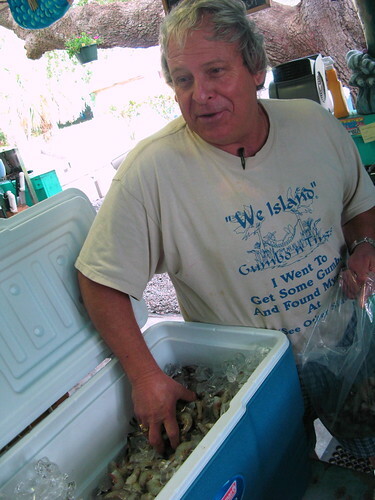 Bill will hand select Carolina shrimp for you by the pound. Here’s a closeup of the Carolina white shrimp. Here’s two nice pieces of flounder Rachel bought. 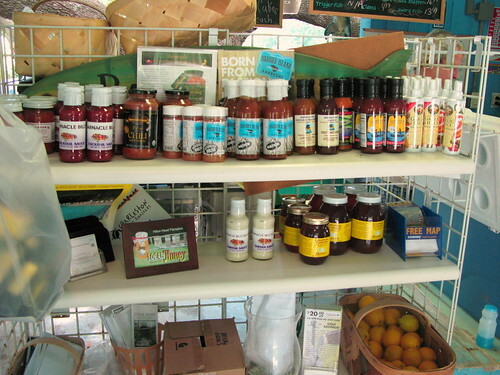 Bill keeps all kinds of spices and sauces on hand for complimenting your seafood. 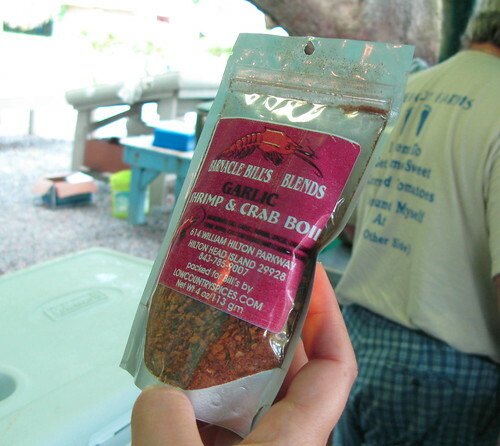 One product that he keeps is his Shrimp and Crab boil, which I recommend heartily. 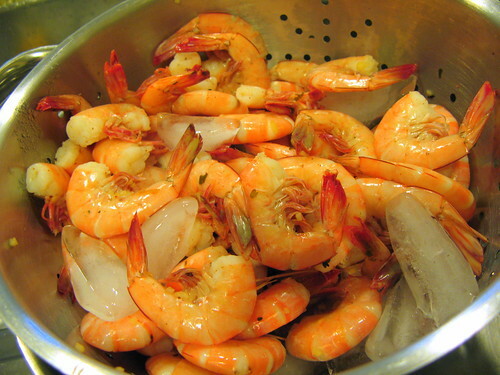 Here’s some of the Carolina Shrimp we bought from him, boiled up in our timeshare unit. They only need 3 minutes in seasoned boiling water and then they are ready to eat. The view outside our timeshare at the Marriott Surf Watch — few local restaurants can match that! This entry was posted on Sunday, September 20th, 2009 at 12:33 pm and is filed under Food, General, south carolina. You can follow any responses to this entry through the RSS 2.0 feed. You can leave a response, or trackback from your own site. I got so excited reading this article – And seeing the Great pictures!! Brings back such memories! 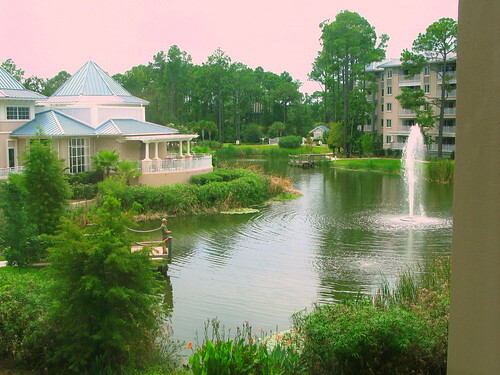 We did the Exact same thing – rented a timeshare on Hilton Head Island (we stayed at the Cottages at Shipyard, a wonderful timeshare for only $75/night that we got through http://www.redweek.com) and got turned onto Barnacle Bill’s! The Carolina white shrimp we cooked in our kitchen at the timeshare was so fabulous that we fixed it every night we were there!!! My mouth is watering just thinking about it! Loved this article – thanks so much! My wife and I vacationed on Hilton Head island this past August. We went to Bill’s and ended up purchasing over $100 worth of shrimp and fresh cuts of fish. 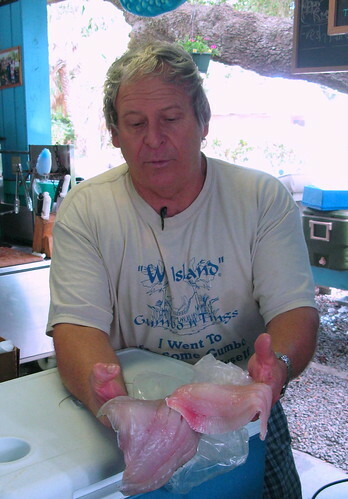 Go towards the end of the day because Bill will make you some good deals on pieces of fish that he has left. The best was the Wahoo. Bought some today from the Fish Guys at the North Market in Columbus, OH. Pretty sure I over paid, but what can you do? Will you still have local fresh shrimp Oct 15-17 ? We will be there that week-end. Thanks. Jason, thanks for your post. My wife and I were on the search for fresh local shrimp while on HHI and we found out way to Bill through your information. We got a pound of medium Carolina white shrimp and two flounder fillets (for another night). I shelled and cleaned the shrimp in preparation for a sautee with mushrooms, garlic and scallions. We made some rice and a sautee of thinly sliced chinese cabbage and locally grown kale. It turned out to be a wonderful birthday dinner for my wife. We’ll be back to visit Barnacle Bill before we leave the island. We are at Surf Watch right now and will check out BBs tomorrow! We own here and this is our 4th year. Sad to say that while we’ve noticed the shack before we’ve never stopped. We’ll change that tomorrow. My wife and i come there almost every year except last year.she got a 5lb lobster tail last time that was great, do you ship out of state? There has been nobody else that even comes close to that let alone your great hospitality. God bless you!Dave and Donna from ohio. Bill is away tending to some family business, hopefully he’ll be back soon. He’s one of a kind–a real throwback to someone who actually loves what he does and provides exceptional service and hospitality. They should make him mayor of Hilton Head, but then again DON’T. If they do he’ll have to close up. 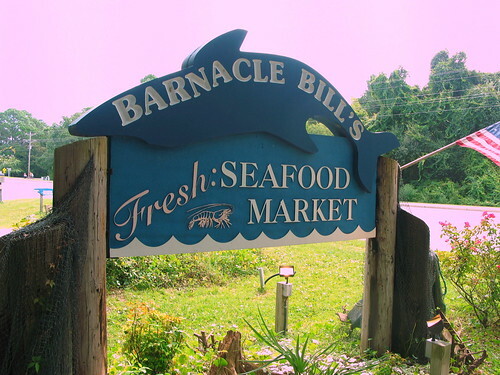 When we were last in HH, we stopped in at Barnacle Bill’s to pick up some shrimp, but could not resist more of his vast selection of fresh, local, seafood. What a feast we had that night! Even though there was a long line, he gave each customer his undivided attention and uniquely personal service by not hesitating to suggest the best way to prepare the selected seafood. That was special!